The James Madison Dukes football team, founded in 1972, plays at Bridgeforth Stadium and is currently coached by Mike Houston. The JMU football team was rarely the centerpiece of JMU sports until the hiring of prior coach, Mickey Matthews, in 1999. Since then, JMU has gained recognition as one of the top programs in NCAA Division I FCS football. Notable Dukes include Charles Haley, the only player to win five Super Bowl rings and is also an inductee of the College Football Hall of Fame and Pro Football Hall of Fame; Scott Norwood, the Buffalo Bills' all-time leading scorer; and Gary Clark, a pro bowl wide receiver for the Washington Redskins. Just five years after (then) Madison College had become a coeducational institution, the Dukes fielded their first football team. Football was the brainchild of Dr. Ronald Carrier, Madison's president at the time, who was attempting to change the psychology of the campus away from an all-women's teachers college. The first game took place on October 7, 1972 against Shepherd College's junior varsity team at Harrisonburg High School. The team consisted of a few dozen walk-ons and was coached by 30-year-old Challace McMillin. In 1975, the Dukes had their first – and, to date, only – undefeated season and won the Virginia College Athletic Association title. Two players, Madison Hall of Fame quarterback Les Branich and offensive guard Jeff Adams, played on both the Dukes' only winless season in 1972 and its only undefeated season in 1975. For the 1980 season, Madison made the jump from NCAA Division III to NCAA Division I-AA where they played as an Independent through 1992. After twelve seasons the Dukes would join the Yankee Conference, which would become the Atlantic 10 Conference in 1997, then finally the Colonial Athletic Association in 2007. The Dukes made the NCAA playoffs in former head coach Mickey Matthews' first year with the team and in 2004, the Dukes won the Division I-AA (now FCS) National Championship behind quarterback Justin Rascati and running back Raymond Hines. They were the first and only team to win three games on the road to advance to the National Championship Game. They returned to the playoffs in 2006 but suffered an early exit to the hands of Youngstown State University. 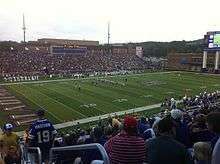 The Dukes went to the playoffs again in 2007, traveling to Appalachian State in the first round. While down 27–28, JMU lost the game with a fumble on the ASU 8-yard line in the closing seconds of the fourth quarter. In 2008, they posted a 10–1 season record (the lone loss coming in the season opener to FBS team Duke) and received the top seed in the playoffs behind sensational quarterback Rodney Landers. After defeating Wofford and Villanova (for the second time that season), they were defeated by the Montana Grizzlies in the semi-final round after Landers went down with an ankle injury. A $62 million stadium expansion to Bridgeforth was completed in 2011, adding an upper deck, club seating and 17 private suites. Bridgeforth's official seating capacity is approximately 24,877, and is designed so it may be expanded to seat over 40,000. Matthews gained his 100th career victory on October 6, 2012 in a 13–10 win over the Towson Tigers. At the end of the 2013 season, after going 6–6 and missing the FCS playoff for the fourth time in five years, Mickey Matthews was let go as the head football coach after 15 seasons at the helm for the JMU Dukes. On December 21, 2013, Everett Withers, assistant head coach and co-defensive coordinator at Ohio State was named as the sixth head coach in the program's history by athletic director, Jeff Bourne. Prior to his work at Ohio State, Withers was interim head coach for North Carolina during the 2011 season after the dismissal of Butch Davis. His first win as interim head coach at North Carolina was against the Mickey Matthews led James Madison Dukes on September 3, 2011. While at JMU Withers compiled a 19-7 overall mark while making playoff appearances in both of his years in Harrisonburg. He also helped JMU receive national attention when ESPN's College GameDay show traveled to Harrisonburg to feature the 2015 Dukes. On January 18th, 2016 James Madison University named Mike Houston as head coach of the Dukes football program. Houston was formerly head coach of the Lenoir-Rhyne Bears (2011-13) and Citadel Bulldogs (2014-15). Houston was very successful at Lenoir-Rhyne claiming three conference championships and an appearance in the NCAA Division II Football National Championship. At The Citadel, Houston led the Bulldogs to their first SoCon conference championship since 1992. In 2016 Houston defeated 4 FCS top 25 teams on the road as he lead the Dukes to the 2016 Colonial Athletic Association football title with a 20-7 win over Villanova University gaining the University's first ever back to back titles. In the 2016 FCS playoff second round he and the Dukes defeated the University of New Hampshire 55-22. The Dukes have appeared in the Division I-AA/FCS Playoffs 13 times, most recently in 2016. Their combined record is 9–11. They were Division I-AA National Champions in 2004. ↑ "JMU Logos and Marks". Retrieved 2016-04-01. ↑ "2011 College Football Hall of Fame Enshrinees". 1 2 "JMU – First Football Game". James Madison University. Retrieved 2011-07-20. ↑ "JMU – Undefeated Season". James Madison University. Retrieved 2011-07-24. ↑ "College Football Data Warehouse". Retrieved 2011-07-24. ↑ "James Madison hires Ohio State assistant Withers as head coach". FoxSports.com. Associated Press. December 21, 2013. Retrieved December 21, 2013. ↑ "Everett Withers Named Carolina's Interim Head Football Coach". tarheelblue.com. 2011. Retrieved August 3, 2011. ↑ "Renner's Record Setting Day Powers 42–10 Tar Heel Win". tarheelblue.com. 2011. Retrieved September 7, 2011. ↑ "JMU Names Mike Houston Head Football Coach". James Madison Athletics. 2016. Retrieved February 24, 2016.